Christians that the Bible was not two books, Old and New Testaments, but one unified book. proof. Here are the relevant scriptures. 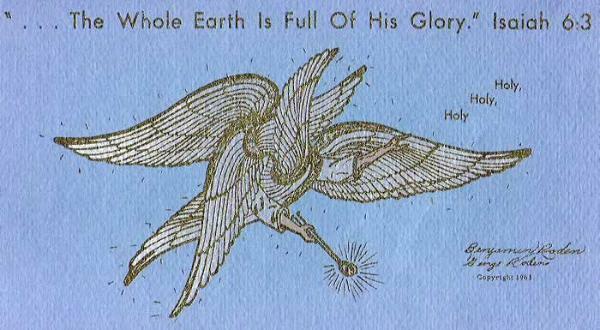 First the seraphim, pictured above, as described by Isaiah. Lo, this hath touched thy lips; and thine iniquity is taken away, and thy sin purged." (Is. 6:1-7). 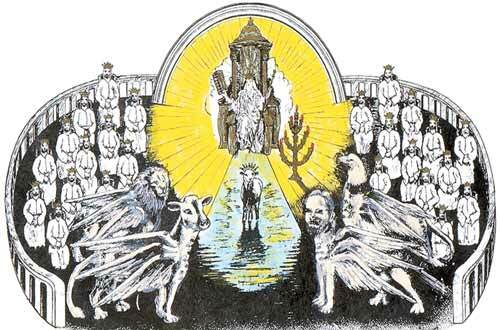 the cherubims, Ezekiel describes them in two chapters. Here are the scriptures. wings of every one were joined one to another, and two covered their bodies." (Ez. 1:5-8,10,11). another wheel by another cherub: and the appearance of the wheels was as the colour of a beryl stone. river of Chebar (site of Ezekiel's first vision)." (Ez. 10:8,9,12,14,15). with soles that looked like calf's hooves. Their bodies, backs, hands, and wings were covered with eyes. face of a man, then the face of a lion, and finally, the face of an eagle. cherub on the other end... And thou shalt put the mercy seat above upon the ark..." (Exodus 25:17-19,21). in Dan." (1 Kings 26-29). Almighty, which was, and is, and is to come." (Rev. 4:6-8). V. T. Houteff has explained the symbol of the beasts from these and other verses of Revelation 4 and 5. Lamb, having every one of them harps, and golden vials full of odours, which are the prayers of saints. those that shall be judged." rest not day and night, saying, Holy, Holy, Holy, Lord God Almighty, which was, and is, and is to come." is, God before the judgment, in the time of the judgment, and after the judgment." king of beasts, -- just so the judgment of the living begins with the beast like an eagle, -- king of birds. with a key statement, ""the entire truth of these "four beasts" is not yet revealed."" of the successive groups of saints. For example: the Lion. Houteff said: "The first beast is like a lion. ceremonial section..." (Ibid). God Himself redeemed this first group of saints. take away, and none shall rescue him." (Hos. 5:14). said: "The second beast being "like a calf," it is evident that he represents the sacrificial... section." (Ibid). The second group of saints is redeemed by the Holy Spirit. which is on the east side of the city." (Ez. 9:3; 10:18; 11:23). the glory of the Lord filled the house." (Ez. 43: 2,4,5). which I will give thee in commandment unto the children of Israel." (Ex, 25:21,22). what I said at the beginning, the second group of saints is redeemed by the Holy Spirit. we beheld His glory, the glory as of the only begotten of the Father,) full of grace and truth." (John 1:1,14). 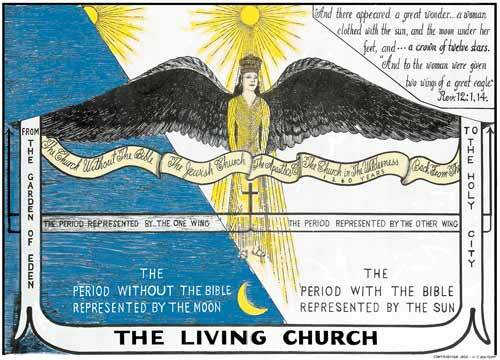 period is symbolized by the flying eagle to denote the church that shall be translated."" (Ibid). weary; and they shall walk, and not faint." (Is. 40:31). vision of the entire universe and must also be full of eyes. They also are like God. angels than the cherubims, the honor of representing the Holy Family must also be given to them. Family. Second, the seraphims and the beasts must be one and the same. with the faces and bodies of men.